It would be fair to say when people think of Turkish food their first thoughts turn to shish kebabs. Meat and vegetables on a skewer roasted over an open flame. What is not to love about a kebab? But Turkish kebabs are so much more than that. Turkey has at least 40 different types of kebabs and each dish is generally regional or origin specific. From the heart of Anatolia, to the Black and Aegean Sea’s and all the way to the Iraq and Syrian borders, kebabs are widely influenced. Here are a few of my favorites. Literally translated the name of this dish is skewer of garbage; however don’t let that alarm you! Deriving from the Aegean region in Ephesus this kebab is made from the left over scraps of lamb from other butcher cuttings. These scraps or “garbage” meat are then pounded together with garlic and tomato and marinated in olive oil, thyme and black pepper. Four or five pieces of meat and generally one chunk of lamb tail fat are strung onto a wooden skewer and cooked quickly over a high heat. The browned meat and crispy fat make for an excellent appetizer to prepare you for the meal to come. 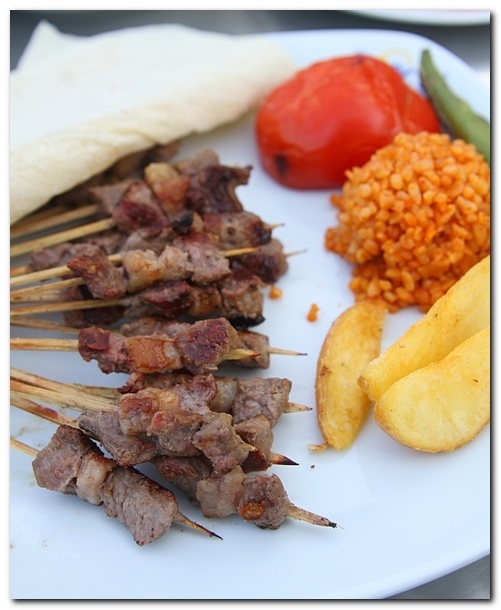 The Adana kebab hails from Biricik in Southern Turkey. In order to be properly designated as Adana kebab special regulations must be met. The meat must be from a male lamb no older than 1 year who has fed in its natural environment with the local flora and fauna. The meat must be hand cut and mixed with red peppers also hand chopped and salt. On rare occasions garlic and green peppers can be added. The red pepper is what gives these kebabs their gorgeous red color as well as their fiery flavor. The lamb mince is then formed around broad iron skewers. If this technique is done incorrectly it will fall apart during the cooking process. If done correctly however the fat in the meat will bond it together during the roasting and a delicious long hollow tube of meat is formed. The meat is turned often and the fat is dapped onto flat bread for collection during the whole process, which the kebab is then served upon. Classically this kebab is eaten with the flat bread, roasted tomatoes, green peppers, onions and parsley. If it’s a less spicy kebab you are looking for the Adana kebab has a brother. 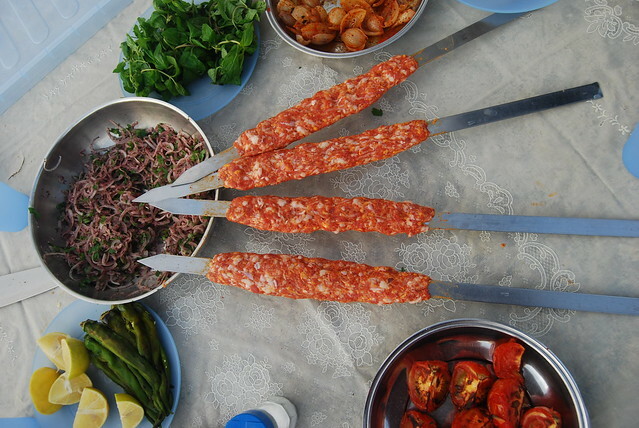 Urfa kebabs are made with the same technique however it is seasoned with cumin and sweet paprika. From the Tokat Black Sea region or even specifically Pazar as many have claimed, this kebab is something of an art. The marinated veal and vegetables generally consisting of eggplant, potato, tomato and garlic is strung onto a hook fashioned skewer. The usta or kebab master then places it on and iron bar inside the special oven called a gürgen. This oven has flames on both sides and is fueled with hornbeam wood, which does not smoke when it burns. After a short period of time the usta pushes the skewers to the back of the oven where they can cook for a longer period of time at a lower heat. This is an unforgettable dish both in its creation and its presentation. Well worth giving it a taste! 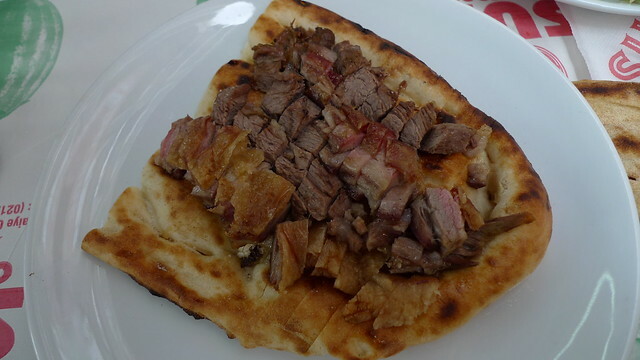 Döner kebab or “turning kebab” is lamb or chicken cooked on a vertical spit, rotisserie style. The vertical technique allows for the meat to self-baste. This is an incredibly popular street food. True döner is made by layering slices of meat, fat, seasoning, peppers and onions onto a giant skewer, which is then rotated near a flame. The meat is sliced off and can be served several ways; the classic service is on a plate with rice. However this dish has become a very popular fast food item so it is also available wrapped in lavash or durum or served as a pide sandwich. They can be eaten plain or with pickles, tomatoes or French fries inside. I never skip the French fries! If you are digging into a döner you may as well go all the way and add those yummy fried morsels! 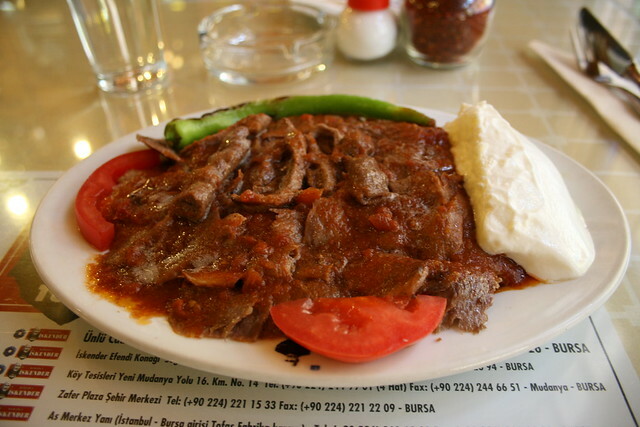 Almost certainly the most litigious kebab on the list, İskender kebab take their name from its creator in Bursa, one culinary genius who was unafraid to think outside the kebab box or skewer as it were. One Mehmet oğlu İskender Efendi took a look at the horizontal rotating kebab and said “ya know what? We can do this better.” And so he took that horizontal skewer and made it vertical. And with that one act, döner history was made. But that isn’t actually where the legalities lay. The issue is in the name itself. The descendent relatives of this kebab king have held firm in their resolution that they, and they alone hold the rights to the Bursa İskender kebabı™name. Alas they have fought somewhat in vain because many imitations abound. Still the original is still open in Bursa and there is one in Kadiköy as well. I’m sure you are wondering by this point what all the fuss is about? The answer is decadence. Strips of döner laid out on a plate are then covered with a savory tomato sauce a dollop of yogurt and coated in sizzling brown butter. If you are at the real İskender kebab your waiter will provide butter service tableside, one of the perks of going for the real deal but a far second to the actual taste. This kebab comes from Central Anatolia and the Mid-Western Black Sea region. This dish is cooked in Earthenware pots. 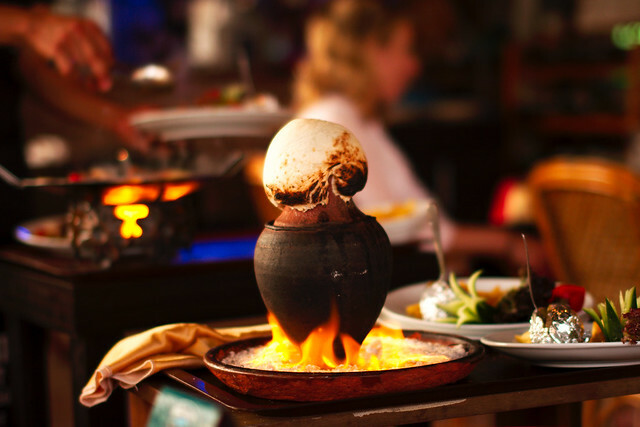 The pots are made by artisans and fired at 800 degrees Celsius for 12 hours. They are then filled with lamb or beef, tomato, garlic and green peppers. They are sealed and the meat and vegetables simmer in embers cooking in their owns juices. The pot is then brought to the table where a bit of theater ensues. The waiter will crack the pot with a mallet and you are then left to enjoy a savory delectable stew. This is a really fun dish for kids to enjoy. Büryan, you cannot leave Istanbul without trying büryan. Delay your flight if you must. It is just that good. Maybe you think you aren’t that into lamb. I was once where you were, I understand, but that all changed for me once I found büryan. Sides of lamb are lowered by hook into a pit where they are slowly cooked over hot coals. The pit is covered and then coated with mud to ensure no air gets in. Above the coals and below the lamb is a copper pot full of lamb meat that cooks in the dripping fat! Three and a half hours later the meat is ready to be served. This process of cooking creates exceptionally tender meat with a layer of crackling skin and crunchy rich fat. No spices are required for this method; the pit does all the work. The lamb is served on a piece of pide with a sprinkling of salt. If you are feeling adventurous and hungry for more, order the lambs tails, you won’t be sorry!